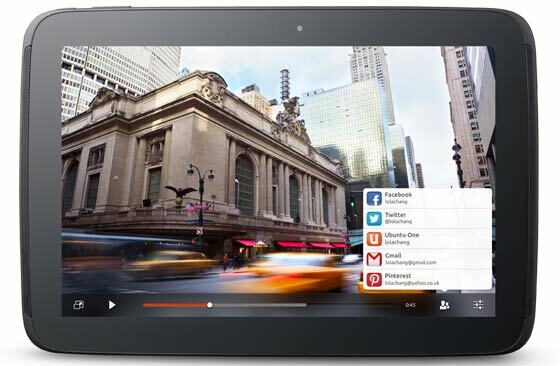 Ubuntu arrives on tablets, it’s “tastefully tactile”. Canonical unveiled its new tablet user interface for Ubuntu yesterday. The unveiling was scheduled to clash with the HTC New York and London events but alas the events were unrelated, HTC hasn’t made an Ubuntu tablet. Instead people who want to use the Ubuntu tablet UI will have to install it on their Nexus 7 and Nexus 10 tablets, at least initially. This is similar to how Ubuntu’s smartphone UI targeted Google’s “standard” smartphones the Nexus and Nexus 4 for initial support. Ubuntu on tablets offers “unique multitasking productivity, effortless navigation and defence-ready security” according to Canonical’s promotional blurb. Moreover the company says that “Ubuntu raises the bar on tablet design and sets a new standard for the post-PC era. Bright. Brilliant. Beautiful. And naturally neat.” Did the copywriter save the best feature until last? Naturally neat... are rival UIs naturally untidy? Canonical has produced a promotional infomercial detailing the ins and outs of Ubuntu on tablets, take a look at it below. App launching and switching is done by swiping in from the left. Swiping from the right edge of the screen shows the “sidestage” where phone apps (and other compatible apps) can run, taking up a portion of the screen. Great for multi-tasking. Notification centre is always available by dragging down from the upper edge of the screen, as are various settings and system services. Swiping up will show you extra controls for the current app in use. Overall the development looks very impressive. Watching the video I particularly liked the final summary section where an Ubuntu smartphone was docked to a larger display and used the tablet interface – with phone apps still available. Then a mouse and keyboard was added and it became a desktop computer, then at the end of the work day the Ubuntu system was used as a remote controlled media centre and gaming console on your large screened living room TV. Can you install Steam on these versions of Ubuntu? If you can then I might seriously consider ditching Android for Ubuntu on my Nexus 7. The prospect of playing some of my indie Steam games on my tablet is very appealing, perhaps this is why Valve have been working so hard on Linux support. I thought that but then its not x86 so Steam Games wont work. Is steam better for “indie tablet games on arm” than Play store, or Apple store, or Windows Store? I dunno why steam gets such a love-in, people are jumping up and down over the no re-selling on PS4, yet steam gets a free pass.